Have you ever played a Dark Souls game? Remember how you died over and over and over and over and over and over? 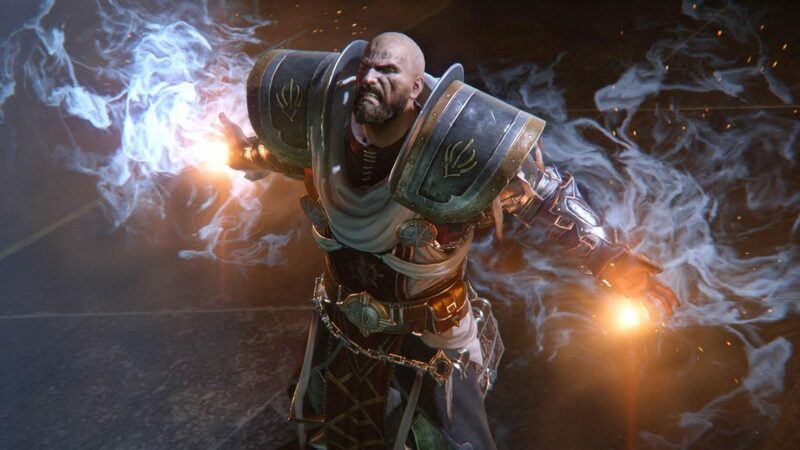 Yeah, Lords of the Fallen is like that. I spent a good couple of hours screaming at my xbox and calling my reflex’s pathetic. Here’s what I think of the game. It’s hard. Extremely hard. Some of you have never experienced a Dark Souls game before so let me explain. 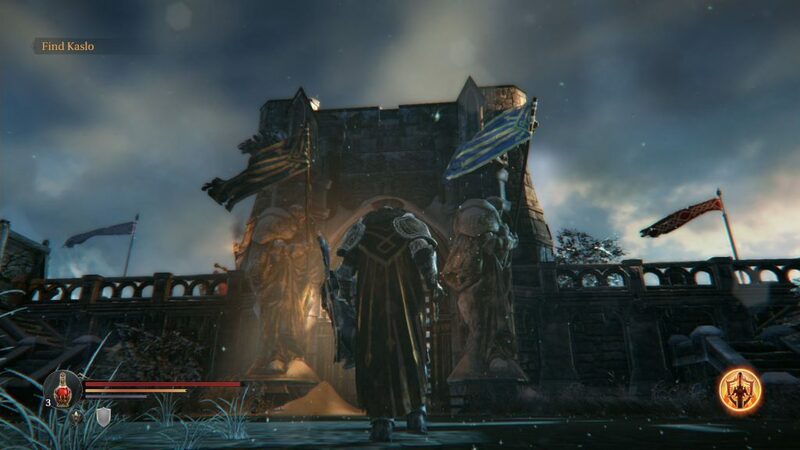 Lords of the Fallen and Dark Souls have a lot in common. They are not hack and slash games like God of War where you can take multiple hits and pick up little health potions. You get hit twice and you die. There are also very few checkpoints. This means that you will play for about ten minutes (if you are any good) and you will die. You have to go all the way back to that checkpoint and repeat everything again. Let’s say you play for about an hour. You are doing really well, but then you blink or your hand twitches or your mom calls you for supper (true story) and you die. Guess what? You start at that same checkpoint that you reached an hour back. If you are unable to get to the spot where you died without dying again, you lose all your experience that you gained and you start at that same checkpoint with nothing. Now you may be asking; why put yourself through this frustration? Well the answer is very simple, it’s a great game. Yes it makes me want to murder someone with my Xbox One controller but if you actually sit and look at the game’s mechanics and how things work you will understand why I put myself through approximately 17 hours of unbelievable frustration. Each enemy has a certain set of attacks and movements. Chances are that when you see a new enemy for the first time, you will die. The game forces you to learn how every single behaves. Once you figure that out it isn’t exactly a walk in the park from there. That same enemy can still kill you if you get greedy with an attack. You have to be aware and on your toes the entire time. After spending a good 30 minutes making it through the starting area you will come to your first boss fight. Guess what? You will die over and over again until you learn how the boss behaves. Once you are feeling successful in whittling his health bar down to a quarter, you realize that his attacks have changed and before you know it, you are dead. I hope you are starting to get the idea here. Enough about death. The game is beautiful. The environments are gorgeous and the character models are highly detailed. I did however experience a bug where during cutscenes the dialogue sound doesn’t play and I would have to restart the game. Besides that I haven’t had any major problems. The combat mechanics are simple and easy to learn but mastering them can be a challenge. The upgrade system took a while to learn but it works nicely. Once you have managed to kill an enemy you gain experience. You get an experience multiplier the higher the amount of experience you are carrying. However if you die you lose everything. You get the opportunity to bank your experience at checkpoints and then use it to level up your character. You are given a finite number of health and magic potions which can only be refilled at these checkpoints so you are forced to use them wisely. 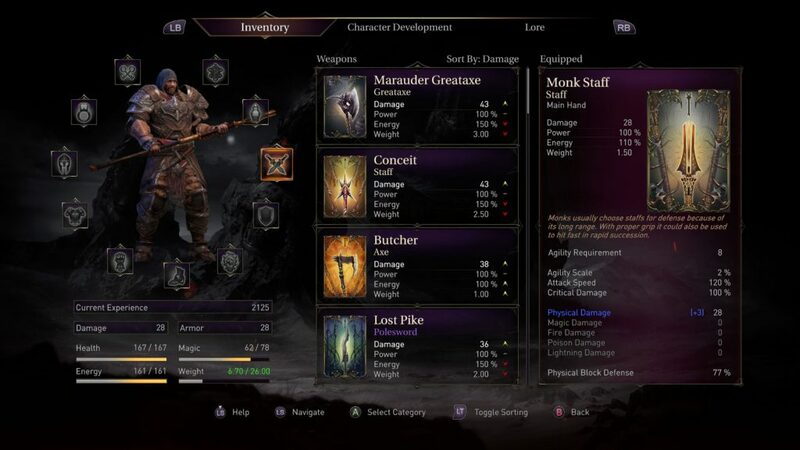 As for your character itself there is an RPG element in the game. You are given a choice of three magic types which determine what your special ability does. Once you have chosen your class, you get to chose what equipment you will but using. These choices are important as they will determine what weapon, armour and shields you can use in the beginning stages of the game and that will have an overall effect on your play style as well. Heavy weapons are slow but do a lot of damage, while light weapons do less damage but you can get more hits in. The system is really well balanced. Speaking of weapons, there is a vast amount of weapons, armour and shields to find and use. Bosses give you specific items and there are chests and hidden areas where you will find items. Depending on your luck statistic for your character, enemies will also drop items. 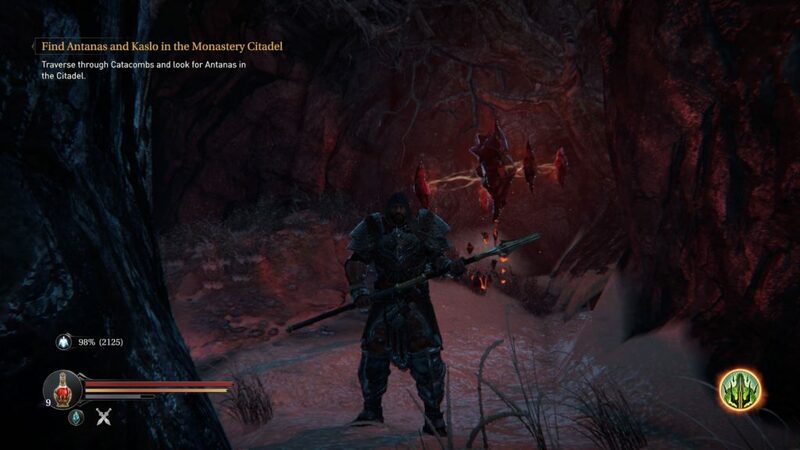 I tend to use light armour and a quick weapons like the monk staff, but after getting a massive battle axe I can’t help myself and I have to go try it out. There are also portals scattered around the semi open world environment. They offer challenges that you can do over and over to farm experience and gain items. You will learn very quickly that it does pay to run through an area again and farm for experience. The enemies get harder without much warning so a little more experience goes a long way. I am very far from finishing this game. I’ve managed to somehow defeat 4 bosses and I feel like I’ve barely scratched the surface of this game, and I am completely fine with that. With these kinds of games I don’t rush to finish them. They take months to finish, often a full year and the best part is I didn’t even buy this game.